Conspiracy theorists everywhere, whip out your tin foil hats. I’m betting on “broadcast oops,” but that’s just me. 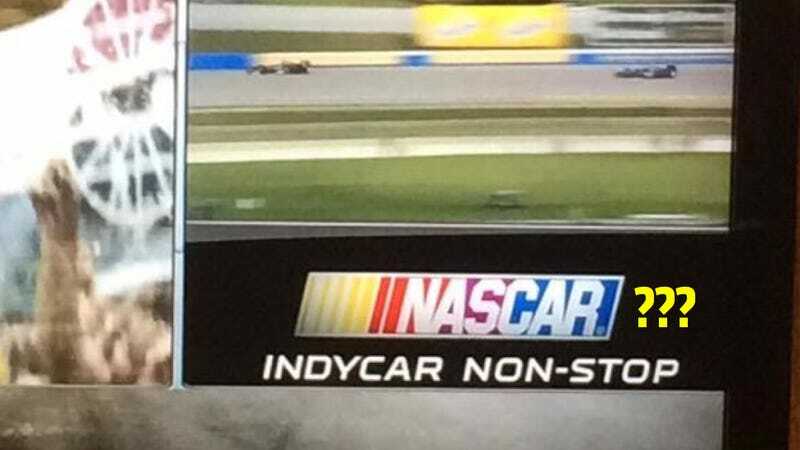 NBCSN appears to have whipped out the wrong logo when they went to a split-screen commercial break during Sunday’s IndyCar broadcast. NASCAR IndyCar. Whoa. I mean, NASCAR already has their tentacles into American endurance racing. They’re both on the same broadcast network now. Both run on ovals and road courses, too. C’mon, 9/11-was-an-inside-jobbers, do your worst.